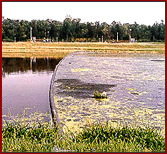 ETP’s environmental covers are used in many heavy duty demanding applications. 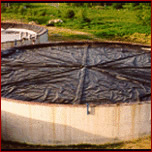 Those applications include bio-gas collection, floating tank covers, daily landfill covers and Turbidity covers. Our materials and expert manufacturing provide the quality, durability and lifespan these types of applications require. Engineered to collect bio-gases that would normally just go into the atmosphere. ETP custom fabricated daily and alternate landfill covers designed to be removed to add additional waste. Another use of Engineered Textile Products covers is Baseball Field Tarps and Equipment Covers.